If you are lucky enough to visit Namibia there is no way of leaving the country without having visited Etosha National Park. At least for me there isn’t. 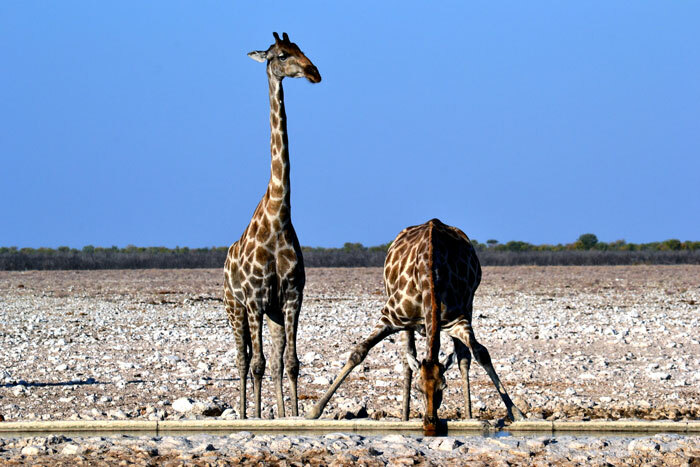 The word Etosha comes from the local Oshiwambo language meaning “The Great White Place”. If you are driving through Etosha it is almost impossible to miss its trademark and linguistic origin. Etosha’s 5,000 square kilometre pan is the remnants of a huge lake that once covered the region. For most of the year this depression finds itself in a white, bone-dry state and is only partially filled when the rainy season (December – February) kicks in. 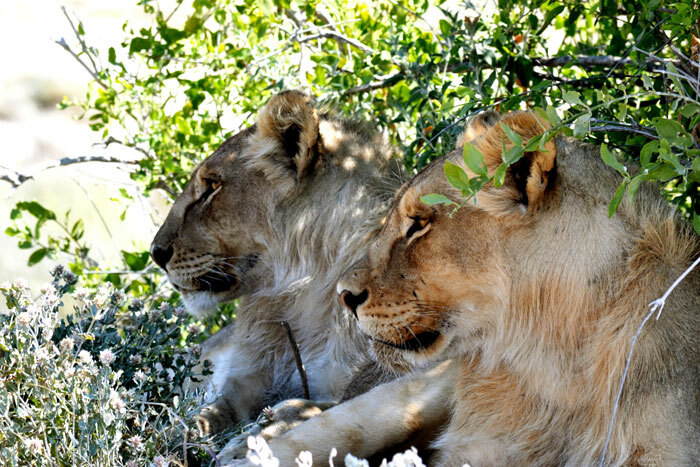 It is self-evident that the landscapes are truly amazing, but Etosha’s pride and fame is its animals. And there’s a bunch of them. I would like to give you some tips on what to find and where to look. A safari is never an exact science so I won’t guarantee success but there are some recurring trends which might prove to be helpful for making the most out of a visit to Etosha National Park. We’ll start with a safe bet: giraffes. If this long-necked, gracious and surprisingly agile animal rocks your boat, do visit the Klein Namutoni Waterhole. During the day you should easily find a few giraffes scanning their orbit of safety before enjoying the refreshing water. Some prefer doing a modest split to get to the water while others do their daily drinking with bended knees. If a giraffe approaches the water and you want to see it drink, be patient. Giraffes take their time because when the head is in a lowered position they are extremely vulnerable and they want to be sure that there are no predators in the vicinity. Your chances of viewing elephants in Etosha are quite substantial. If you are visiting Etosha during the rainy season I recommend you head to Tsumcor waterhole. 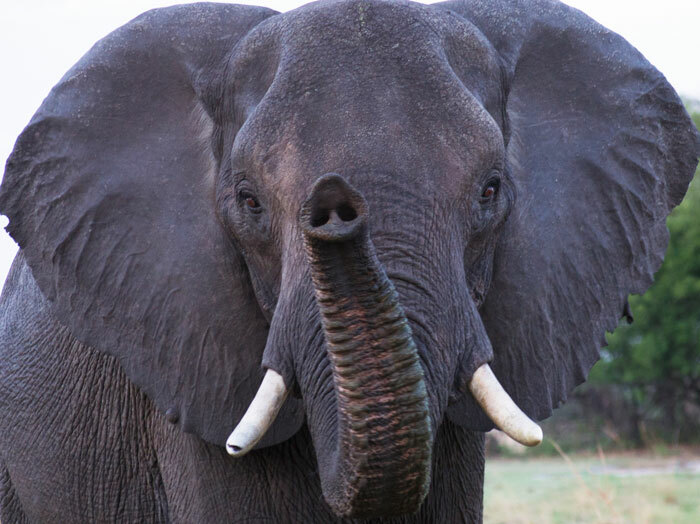 During the rainy season most of the elephants migrate to the north and become very scarce in the park, however you can still sometimes find them at Tsumcor waterhole. Plan a Tsumcor visit at noon or before sunset and your efforts might be rewarded. Night time delights during the day. Halali is the most popular lunch stop in Etosha. The state-run resort comprises of a lodge, restaurant swimming pool and waterhole ‘ Moringa’. It’s name is derived from the trees that surround the pathway towards the waterhole. Legend says that this tree was created with the last seeds God disposed of during the world’s creation. The only problem was that the tree grew the other way around and its roots are exposed on top of the Moringa’s trunk. So hence its name Phantom Tree. 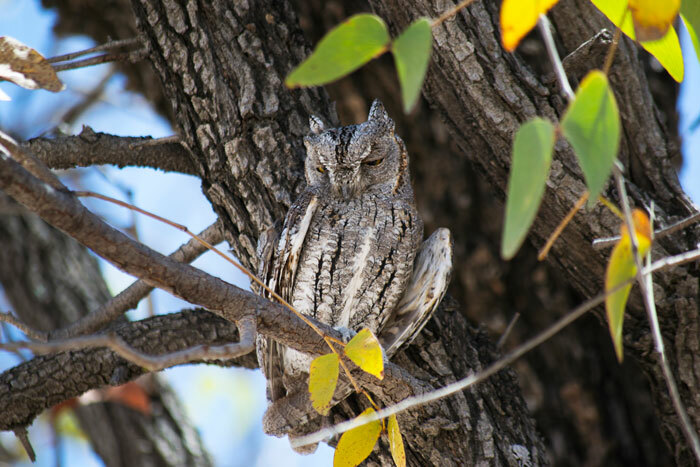 During a lunch stop here you might find an African scops owl at rest, and on your way to the waterhole you might even run into a honey badger. You will find them trashing the local dustbin in search of something edible. It is the end of the day, the park is almost closing and you haven’t spotted a lion yet. All hope is not lost. Stop at the Okondeka waterhole. The drive might feel quite long because in order to get there you have to put in 22 kilometers but after this effort the victory will taste as sweet as ever. Many guides consider this spot the lion waterhole. No luck? Keep your chin up, turn your car around and if you still have a bit of time drive to the Ombika waterhole close to the exit at the Andersson’s gate and you might find the king of the savannah greeting you there. And last but not least: cheetahs. If you are staying at the Namutoni side, I would recommend you do the Fisher’s pan detour which leads you to the waterholes of Tweepalms and Aroe. On that road, drive very slowly and scan the area with an eagle’s eye because you might stumble upon the world’s fastest land animal. Follow it responsibly while keeping your distance and look for a termite hill or an elevated bump in your surroundings. 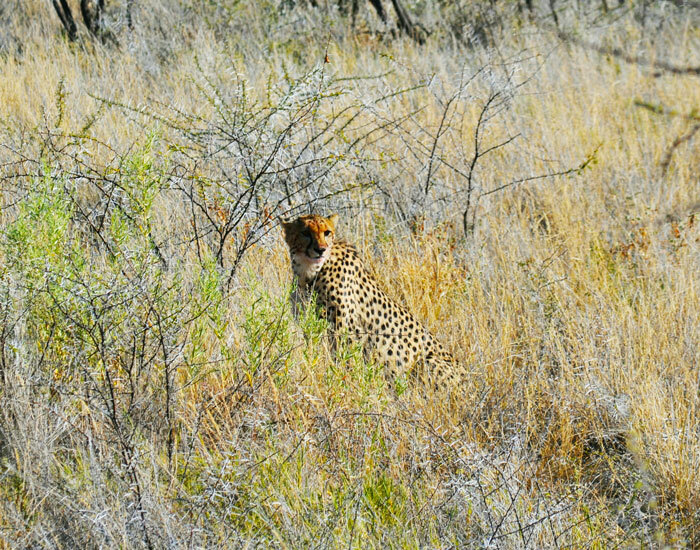 The cheetah might walk straight to it, make a halt and look for some potential prey.